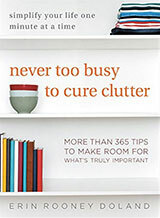 Home › Forums › Time Management and Productivity › Scheduling Strategies › favourite uncluttering books? This topic contains 40 replies, has 25 voices, and was last updated by lottielot 8 years, 1 month ago. I was just re-reading ‘organised from the inside out’ and nodding my head in agreement and working out which bits I’d actually implemented/internalised/ignored. This was complete procrastination as I could have been uncluttering or even hoovering or doing some uni work but, hey, everyone needs inspiration sometimes! I have a couple of other books: Sidetracked Home Executives (those stupid cards drive me crazy, I do not adjust well with being told what to do when, even by myself! ), Sink Reflections (stupid shoe thing drives me crazy, plus her patronising tone of voice, but lots of common sense stuff in there). When things get bad in my house I tend to turn to books for motivation, so which books do other people recommend? I refer back to “Throw Away Fifty Things” by Gail Blanke. I find it to be good motivation. 365lessthings, books aren’t clutter if you re-read them, that’s my motto… Though I wish someone would tell my dh that the reverse also holds true. I like to read books for inspiration, sometimes you just get stuck and need a nudge in the right direction, some new ideas etc. This website is great for that too, but I like a combination. Did anyone ever watch the show Neat? That was Hellen’s show and I was so impressed by how she handled serious clutter issues with such sympathy and practical solutions. My all time favorite is Don Aslett’s Clutter’s Last Stand! For serious uncluttering mixed with great humor, it can’t be beat! I love the Messies Manual. I tend to read it regularly for a few years, then get rid of it, then find another copy at a book sale and have it for a year or two again. I don’t use most of her techniques (tho I like the Mt Vernon Method for actual cleaning) but reading it makes me clean like crazy. I decluttered my Don Aslett books a few years ago, but they were the catalyst for me changing my cluttery ways. They are full of humour and common sense, and I think I’ll order them from the library again. i re-read bits of them constantly. I’ve always considered buying books about uncluttering and minimalism to be an oxymoron. I don’t–if a couple of books inspire one repeatedly to get rid of numerous boxes and bags of unused, unlovely crap, they are well worth the shelf space. And if a few books can help one with the process of getting rid of hundreds of books, well, then, I can’t agree that buying books about uncluttering to be oxymoronic. And yes, I may have just made up that adjective. I agree maybe about the minimalism…but not the uncluttering, djk is right. Anyway, I consider most books in my house (well, those belonging to ME) have to earn their keep by being re-read. Uncluttering books I re-read for inspiration and motivation so they earn their space 🙂 I’m pretty sure our library won’t have any though, they have very limited non-fiction. I don’t really read e-books so a physical book it is, but if it’s not re-read then it is donated. Thanks for the recommendations, will look out for a couple of them. and it’s free, by the lovely leo babauta. my uncluttering books earn their keep too. the everyday person is SWAMPED by advertising and messages of consumeconsumeconsume all day, every day. having some books around offering the other view is very helpful. bandicoot: yes, one or two small books can be mighty in encouragement. Those who think that they are an oxymoron are entitled to their own opinion….I recycle a large stack of junk mail each week from two homes and one business. Not to mention my personal paper clutter and the local newspaper, which I still like to receive in my hands, rather than read online (too much jumping about on the website, imho). I have reduced my drive for buying and consuming this year, and I don’t miss it. This may seem strange, but one of the books that inspires me is Make Do and Mend; I have no desire to make underpants out of old sheets, but seeing how very little people lived with for years on end reminds me of just how good I have it. – simplify your life, the german version. yes, Simplify Your Life, for me, too. I bought it for $3.99 at the discount store, so I am pleased with the price. Very positive and friendly book. All time favorite that I bought as a joke when I was a kid, and found it surprisingly useful. I still rely on ideas from this book! Unfortunately out of print: it is only available used on Amazon…. I’m a beginner to these forums, so I greatly appreciate all your book recommendations, which I can get from the library. Also, I just started reading Brooks Palmer’s daily blog. I like his kinder approach. Don’t care much for the “attack the enemy” style of some writers. ella, thanks for the brooks palmer blog link. I LOVE the phrase ‘have an Ugly Day’. This is so what I tend to do, but usually beat myself up about. Now I have a term for it I think I can schedule the odd Ugly Day and lose the guilt beforehand when I feel more like a Pretty Day! Claycat, I bought Don Aslett’s book on your recommendation and I’m reading it now. Thanks for the information! I like Brooks Palmer’s blog too. The book I like is “It’s All To Much” by Peter Walsh. 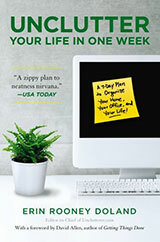 “How to Be Organized in Spite of Yourself: Time and Space Management That Works With Your Personal Style” by Sunny Schlenger and Roberta Roesch. I’ve had this one for years. It does a nice job of helping you find a system that works with you, rather than urging you to do things according to a single rigid plan. It’s only $7 or so new; used copies are .01 + shipping. I like the sound of that one Julia, the best books do let you tailor your system to your personality rather than banging on about shiny sinks or index cards or lace-up shoes! i don’t even own a pair of lace up shoes. ElFish3, I’m glad you got it! It is fun to read. The Brooks Palmer blog is great! Thanks, Ella! i’ve seen “ratio” mentioned often enough that i finally went googling and LO and behold….there is a kindle edition and it’s mine, all mine. thanks to everyone for the recommendation, and wrennard for mentioning it at the exact right time for me. No one brought up the fabulous Regina Leeds, zen organizer and her One Year to an Organized _____ (including Life, Work Life, Financial Life) books. She’s gentle and encouraging and so darn smart. I didn’t know where to add my comment, but I love the cover on Erin’s book as it exists in the paperback issue. I have the hardbound version and the cover gives me hives, all cluttered up with sticky notes. I guess I am trained! @bandicoot — You’re welcome! Hope the Kindle version has a photo of the cover “bullseye” — it is an awesome (and uncluttered) summary of the book’s content. Another uncluttering book: I finally bought the Queen of Clean’s book (“How the Queen Cleans Everything” combines her three previous books, recently on sale on Amazon for $10) so that I would stop buying cleaning products that don’t work! I have cleaned out the backlog of “used once” cleaning products and am now only buying things she recommends. I agree with the recommendations for Brooks Palmers’ blog, but I’ve just finished reading his book “Clutter Busting” and WOW! I thought I was pretty good at decluttering, but he has had me fossicking through all the artifacts of my past with fresh eyes (and yes, most of those things are now GONE! And I feel great about it). I’m trying to wean myself from books of all kinds: both Peter Walsh and Erin’s book are very good. I’d like to read the Regina Leeds books as the covers made me chuckle – all your ducks in a row LOL! – and am glad to hear the content is worthwhile. many thanks to everyone who recommended brooks palmers’ book. i am a few chapters in (on the kindle) and i cannot put it down! what a kind, wise soul he is. i am ready to take out another layer of stuff. I love what he says about clutter and memories. My mum has Alzheimer’s and it has made me see things in a very different way. People are always talking about preserving photos and letters from the past, but what about people who don’t even recognise themselves in photos, let alone anyone else? It’s completely and utterly devastating. I’m probably not making much sense, sorry.